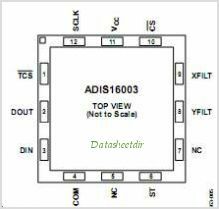 The ADIS16003 is a low cost, low power, complete dual-axis Accelerometer with an integrated serial peripheral Interface (SPI). 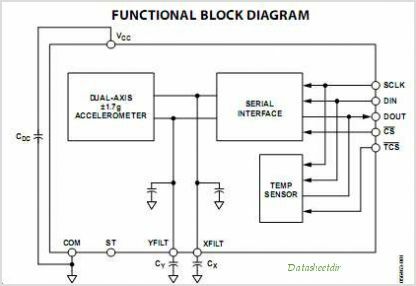 An integrated Temperature Sensor is also available on the SPI Interface The ADIS16003 measures acceleration with a full-scale range of 1.7 g (minimum), and it CAN measure both dynamic acceleration (vibration) and static acceleration (gravity). An externally driven self-test pin (ST) allows the user to verify the Accelerometer functionality. The ADIS16003 is available in a 7.2 mm 7.2 mm 3.7 mm, 12-terminal LGA package. This is one package pinout of ADIS16003,If you need more pinouts please download ADIS16003's pdf datasheet. This is one application circuit of ADIS16003,If you need more circuits,please download ADIS16003's pdf datasheet.